The latest report from the US Census Bureau shows the homeownership rate for the third quarter of 2018 at 64.4%. Slightly up year-on-year (from 63.9% for the same period in 2017), this signals a steady incline since hitting a 62.9% low in the second quarter 2016. While 65-year old-plus householders continue to represent the largest share of the homeownership rate, recent data shows a shift underway. In particular, homeownership rates for Millennials/Generation Y – those aged between 24 and 34 – are on the increase; they now stand at their highest level in five years, at 36.8%. While other age groups have been steady in the recent years, this younger cohort has shown a surprisingly strong comeback since the loosening of mortgage financing from the second quarter 2017. As a group of young adults who are mainly first-time homebuyers, millennials are the driving force behind the demand for homes in the US and the accompanying rising homeownership rates. This runs contrary to popular views about these individuals – that they tend to delay getting married and starting their own family, therefore delaying home-ownership. Yet recent studies show that this group is similar in many ways to previous generations when it comes to the desire to own a home. Strong job growth also stimulates the appetite of home buyers. According to recent data from the US Bureau of Labor Statistics, total employment increased by 250,000 in October 2018 with the unemployment rate remaining at 3.7% (the lowest level since 2001). Job gains during this strong market have averaged 213,000 a month during 2018, faster than the average of 180,000 a month during the first 10 months in 2017 and also the monthly average of 199,000 in 2016. 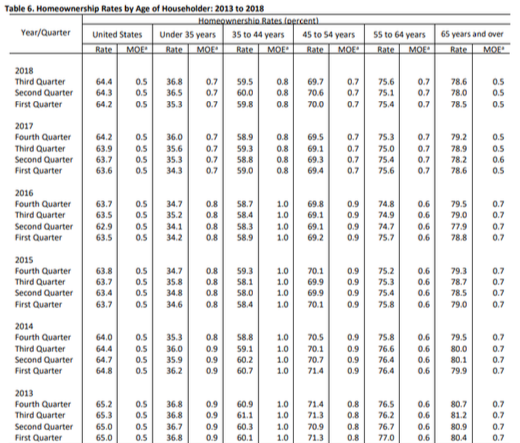 While the great recession and subsequent limited housing supply has hampered home-owning ambitions of many millennials, this trend of job growth has resulted in the 25 to 34-year olds securing higher-paying jobs. The next step has been for them to turn to the housing market. With approximately 73 million millennials across the US, their appetite for homeownership is expected to sustain a robust and growing housing market over the long-run. In fact, home-builders are already adjusting to the millennials. They are in tune with their preferences of smaller, more affordable homes that also provide greater energy efficiency. This younger generation also typically wants to live in one of two areas. Those in their 20s look to base themselves, often renting, in core urban areas. Those in their 30s who are ready to raise a family and buy their own homes in quieter, more spacious and more affordable areas prefer the suburbs. This also gives access to required amenities such as schools and shopping centres, plus connectivity to their places of employment. A study by the Urban Land Institute (ULI) shows millennials tend to prefer single-family, detached homes in the suburbs that fulfil those criteria. More specifically, 70% of respondents to this ULI report said they expect to own a home by 2020, with 62% of them expecting to buy a single-family home. Given the low housing supply and shortage of buildable lots, especially in the most desirable locations, higher prices seem likely to follow. As a result, land that is entitled and ‘shovel ready’ near growth corridors will be attractive to home-builders; in turn, more affordable housing supply is on the cards. Robust job and population growth in the US, combined with a healthy pro-business economy, are signs that the recovery and current strength of the US housing market is sustainable. This suggests that although challenges exist in terms of limited housing supply and housing affordability, US real estate will remain an attractive market for long-term investors. Against this backdrop, investing in properties in the path of growth is a good place to focus for the time being.